Our walk with the Lord is a progression towards fullness. Woe unto the person who starts and then stops. One of our messages asks the question, "Is your dwelling a house or a tabernacle?" speaking of where you are spiritually. If your dwelling is a house, then you have a permanent dwelling. You are not planning to move. Many Christians do that. They build themselves a spiritual house with their doctrines and Christ is on the outside knocking on the door, If any man hear My voice, and open the door.... Are you hearing Him? Is the Lord revealing Himself to you today? 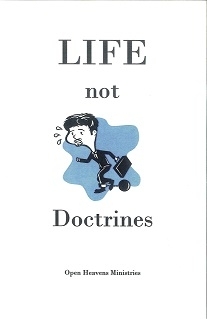 We must move beyond doctrines and find the Life.